Isaac Amoah played in the youth of Ajax and continued at other local clubs in the Amsterdam region before moving to NEC. Ghana-born Amoah made his first team début at KV Kortrijk. 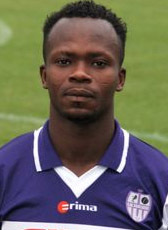 Amoah stayed for short periods at the clubs and moved to Wevelgem City and Roeselare within a short period. In the summer of 2006 his contract at Roeselare was not extended. After that, he played a few friendly matches for SW Harelbeke from the 3e Klasse and earned a contract. However, the season was not successful when he got injured for almost the whole season. The next season 2007-08, Amoah has signed a 1-year contract at OMS Ingelmunster. When his contract expired he moved to a First division club of Malta Gozo, Sannat Lions FC in September 2008. Sannat Lions is a club on the isle of Gozo, part of Malta. It is uncertain if Amoah ever played official matches for the club. He suffered from injuries and recovered in his home country Ghana in January 2009.